(Newser) – Thousands of workers in St. Louis will likely see smaller paychecks starting Monday, when a new Missouri law takes effect barring local government from enacting minimum wages different than the state minimum, the AP reports. 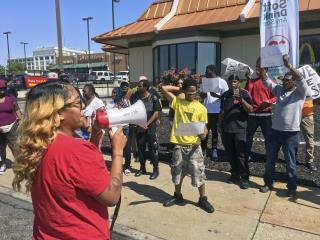 The law is drawing protests in St. Louis and in Kansas City, where a recent vote approving a higher minimum wage is essentially nullified without ever really taking effect. The impact is direct in St. Louis, where the minimum wage had increased to $10 after the Missouri Supreme Court sided with the city in a two-year legal battle. Days after the Supreme Court ruling, Missouri's Republican-led Legislature passed a statewide uniform minimum wage requirement. The state minimum wage is $7.70 per hour. Republican Gov. Eric Greitens declined to veto the bill, allowing it to become law. https://www.attn.com/stories/389/how-do-american-fast-food-workers-stack-against-rest-world The United States ranks 14th in the world for highest federal minimum wage, below Japan ($8.48), Germany ($11.60), France ($12.22), San Marino ($12.49), Luxembourg ($14.24), and Australia, which has the highest minimum wage at $15.81. Denmark has no federal minimum wage, but has a median minimum wage of $20/hr across its industries. And while these countries offer higher wages, for the most part, their food prices remain consistent. Using The Economist’s famed “Big Mac Index,” we can see that, despite workers in Denmark making more than double their American counterparts, they are only paying $0.35 more for a Big Mac. A Big Mac costs $4.80 in the US, $5.15 in Denmark; and of the countries mentioned that have a higher minimum wage, France pays $5.25 for a Big Mac, Germany pays $4.94, and Japan only $3.64. McDonald's workers receive a total of $1.2 billion in public benefits assistance annually, despite the fact that McDonald's made $5.46 billion in 2012 profits, and its CEO made nearly $14 million. In 2013, the average top restaurant CEO compensation was 721 times greater than their workers' pay. In the United States, the average age of a minimum wage worker is thirty-five years old. So much for the GOP being the party of small government.